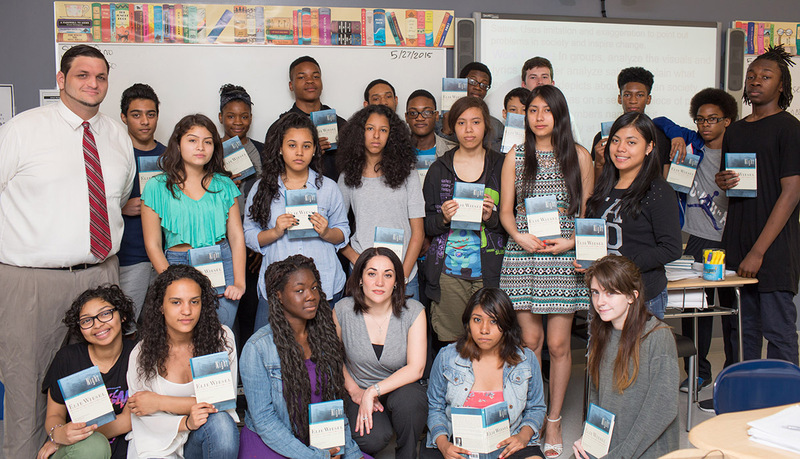 Erica BergerStudents and their teachers with Elie Wiesel’s book “Night.” When 10th-graders in Jaclyn Bifano and Louis Rimesso’s English class at the HS of Art and Design in Midtown East read Elie Wiesel’s powerful memoir “Night,” they did more than just read the words. They watched a video of Wiesel walking the grounds at Auschwitz. They studied the lives of ordinary German citizens and how they behaved during World War II. They analyzed Nazi propaganda and even Hitler’s own artwork. For their final projects, they created memorial artwork and poured their hearts out to Wiesel in letters that revealed the depth of their connection to the book. Their words touched Wiesel, who wrote back to the students just a few weeks after receiving their letters. Bifano and Rimesso deliberately scheduled the unit to complement their students’ study of the Holocaust in global history class, crafting lessons in such a way that students would be able to reflect in class about what they had read the night before. Wiesel’s words resonated even with typically reluctant readers, some of whom were so affected by the book that they began doing their own research on the Holocaust. Wiesel’s response also deeply touched the students.